Happy Monday, all! I can’t believe it, but 2016 is here. Woot woot! 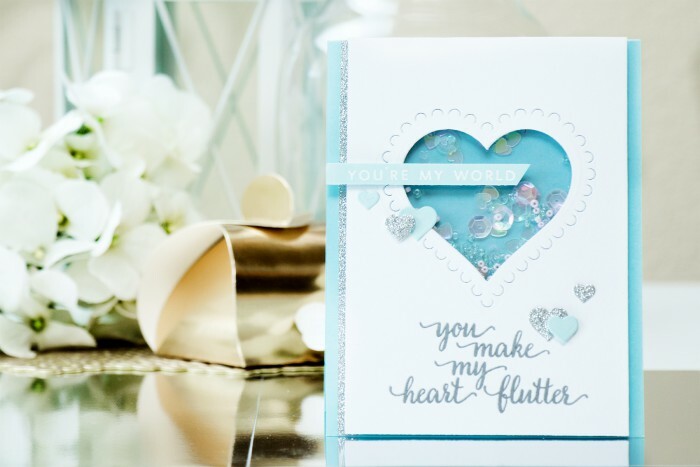 Hero Arts is introducing their January’16 My Monthly Hero Kit today – its a themed one and perfect for Valentine’s Day cardmaking and it also works well for making shaker cards. I myself am not big on shakers, but I couldn’t resist using Lucy’s shaker mix from my kit and made a shaker card. Instead of using traditional pinks and reds I went with light blue and silver. I think this color combo makes a great alternative. This kit includes a few fun and unique dies that allow you to create partially cut elements on your projects, I used the open heart as well as the medium-sized heart with scallops to create my window. I love how these two dies work well together and enhance each other. For my sentiment I used You Make My Heart Flutter one from the stamp set in my kit and stamped it using two colors of ink – charcoal and than silver, love this effect! 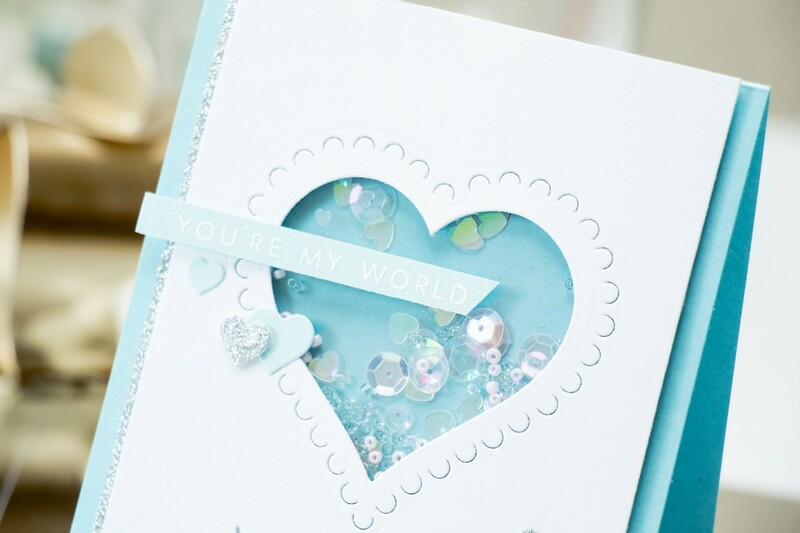 I also incorporated all small hearts from the Add-on kit and die cut those out of blue and silver. My shaker element was created using the sequin mix from my kit, I did however remove the pink sequins and only left the clear in. 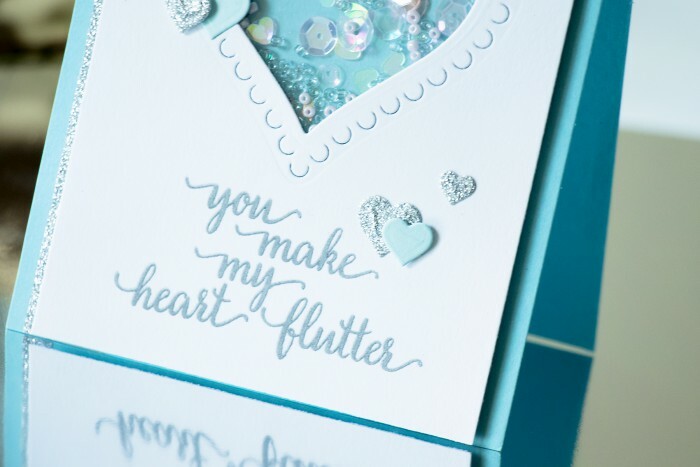 The full kit contains two 3×4″ stamp sets, three dies including two paper layering dies, 2 ink cubes, an exclusive mix of sequins created by Lucy Abrams, gorgeous vellum with iridescent speckles, acetate, cards and envelopes. The price for this kit is $29.99. There is also an add-on die set (Valentine word and small hearts) to purchase separately. The kit goes live in the Hero Arts store on Monday January 4th at NOON eastern. The kit is available for a limited time only – once it’s gone, it’s gone. What a gorgeous shaker! LOVE that die!! like that you used blue and silver, it looks lovely. Love this card and this kit is so fun! Love the unexpected blue. This card in gorgeous. Thanks so much for sharing. Beautiful card. Love the blue! Love the gorgeous pastel blue. And the sequins are so pretty. Beautiful card! I love that you did it in blue! love how you used blue instead of pink or red…gorgeous. Wonderful, love using the blue. Thanks for sharing. Oh wow! I love this Kit!!!! And your card is so cuteee!!!! Love the blue!! This is a beautiful kit!!! Gorgeous card! Love that blue card stock! Fun shaker card. I love all the parts of this kit. Very pretty card…love the blue route you took. Gorgeous! This kit won’t last long!!! I am SO happy to see you make a Valentine card in non-traditional colours, it is perfect. This is what I love best about your cards, non only are they beautiful but very original as well. Very pretty card… love the color combination!!! I love the colors you chose! So pretty and perfect with the sentiments! Thanks so much for sharing! Your cards are always stunning!! Love the shaker card. Colors are beautiful. Gorgeous, those colors are stunning! Love the non-traditional color for your card. Beautiful color choice. I love that you used colors other than the typical red and pink….so pretty. Wonderful choice of colors!!! And what a great kit! Love how you did your card with your color choice, so cool!!! Love this kit, so sad it’s already sold out!! I can see lots of uses for this one, and I’ve never done a shaker card yet!!! Thank you for the chance to win……. This new kit by HA is simply a must-have! It’s so nice to see the alternative take on the colorway! Very pretty results! Love the color. What a beautiful card. This card is utterly gorgeous…wonderful job! Love this kit!! Incredible card! 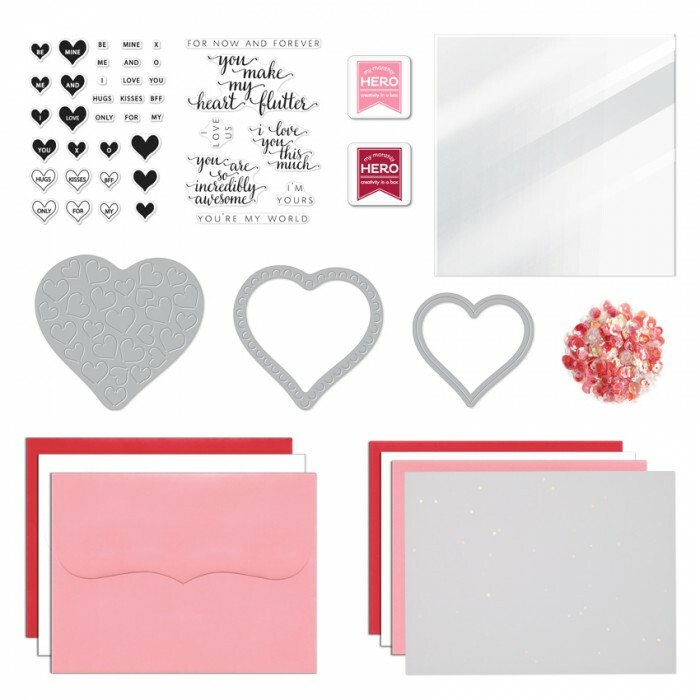 I’m not big fun of traditional valentine palette (you need to have a great sense of style to make a card that won’t look to cheese) and love the idea of this color combo. I LOVE this card in blue!